Sleeves and dress cut just right. 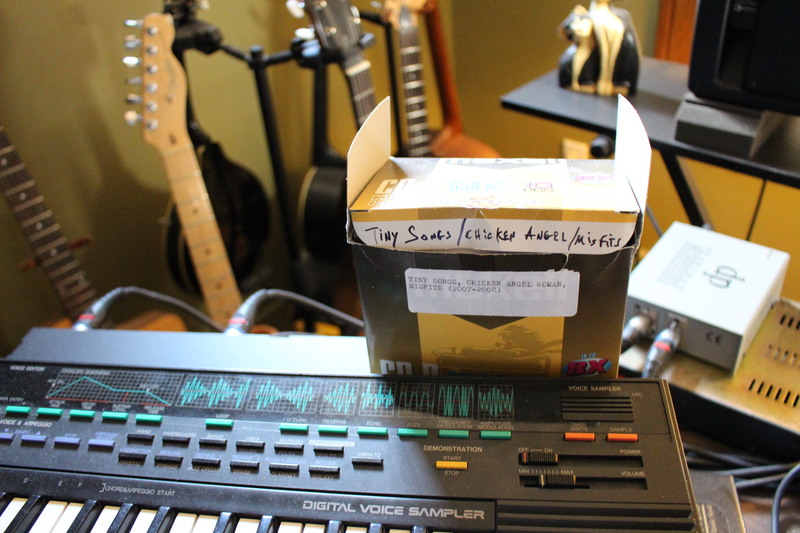 For a year now I’ve had somewhere around half an hour of raw footage collecting digital dust on a hard drive from the day Ron and Dean came over to record the piano part for Ron’s song “Tattooed Lady”. I figured it was time I got around to editing it. The finished segment came out shorter and snappier than I expected, but I think it works as a little slice of studio life. What kept me from making it longer was the lack of visual movement. I didn’t set up a second camera to grab Ron and Dean, so while there’s a good bit of dialogue between the three of us, you would only see my headless torso no matter who was talking at any given time. That would get old pretty fast. Better to keep it brief. In a minute and-a-half you still get a bit of banter, a pretty decent idea of the feel of the song and what I played on it, and a few moments from takes that weren’t used in the final mix (as far as I can tell, what’s on the album is about 80% of my penultimate take, with the rest flown in from the very last take we did right after the camera ran out of recording time). I’m trying not to share too many more video-related things before the big beefy “this has been the last few years of my musical life” video is finished, but I don’t think this little bit is giving anything away, and I kind of like the way it turned out. Someone should write a pulpy, jazzy detective novel called “Trumpet Trouble”. Just got this little guy back not long ago. 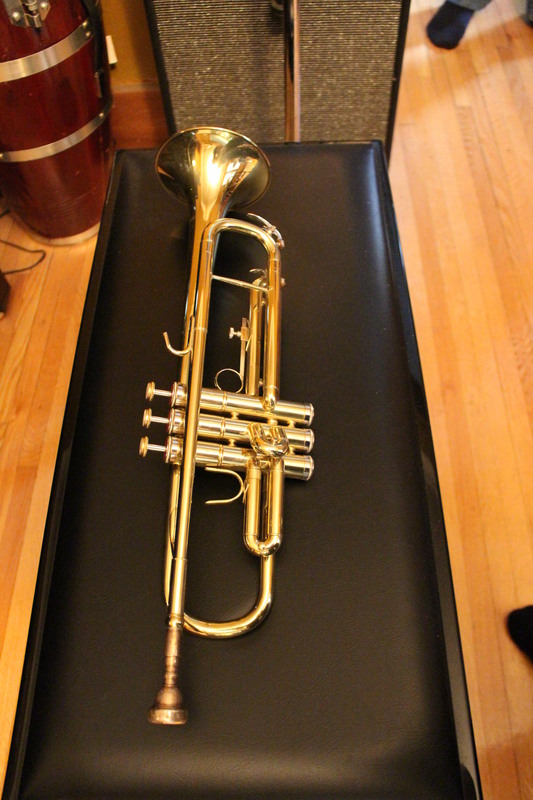 Thanks to Kelly for taking good care of Señor Trumpet over the last few years. I’m lucky enough now to know some people who, unlike me, can actually play brass instruments, and who are open to doing session work. If you’re thinking that might stop me from using the trumpet and the bugle to lob occasional dissonant curveballs at songs that don’t seem to want them, well…I’ll probably keep doing that here and there until the end of time. Ha! You can never have too many acoustic ballads with random atonal free jazz trumpet solos. Hark! I hath passed the halfway mark! 98 songs down. 90 still to go. I’m still not as far along as I’d like to be, but I’m beginning to think I might actually finish this pet project someday.